Georgia passes $200 electric car fee: Why are states punishing people for buying efficient vehicles? States used to help people buy electric and hybrid cars. Now they’re punishing them for it. Innovation has created a new dilemma: We now have a class of people (mostly well-off) who can choose to get around without having to pay the gas tax. Photo illustration by Slate. Photos by Nerthuz/iStock/Thinkstock and crossstudio/Thinkstock. Super-fuel-efficient cars have become political footballs. Supporters argue that investing in battery technology and the development of hybrid and electric cars will help reduce our dependence on fossil fuels. Meanwhile their critics rail against Department of Energy loans to battery and car companies while state legislatures have passed laws that ban Elon Musk’s Tesla from bypassing influential local dealers and selling its vehicles directly to consumers. This backlash reached a new level on April 2 when Georgia’s Legislature passed a big transportation law that would, among other provisions, end the state’s generous $5,000 tax credit for electric vehicles and slap a new $200 registration fee on people who already own them. Gov. Nathan Deal hasn’t signed the law yet but is expected to do so. Where his state once provided financial incentives to people who drive ultra-fuel-efficient cars, it will soon penalize them. 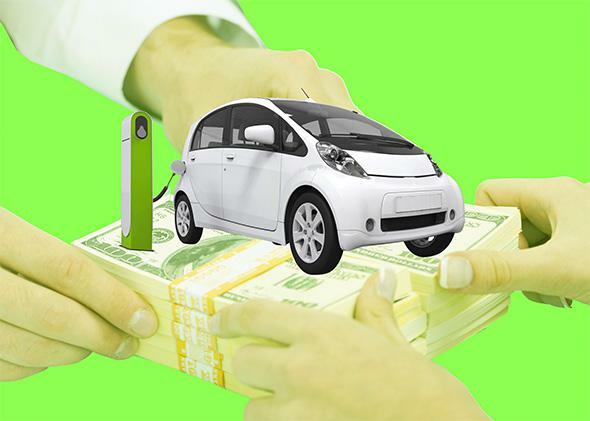 Georgia isn’t the first state to pass a law targeting the wallets of electric and hybrid vehicle owners. Liberal Washington state led the way—in 2013, it pushed through a $100 annual tax on electric cars. Virginia followed with a $64 charge on hybrids. To a degree, these taxes on efficiency are the byproduct of the larger political and cultural war over state and federal support of battery innovation. But they’re also a sign of how the ongoing automobile revolution isn’t just transforming the way some of us drive but an entire system of taxing drivers to maintain the roads they drive on. Currently, federal taxes on motor fuels—18.4 cents per gallon of gasoline, 24.4 cents per gallon of diesel, and so on—go into the federal Highway Trust Fund, which gets distributed to the states for upkeep and construction. States collect billions of dollars each year in their own gasoline taxes. Until recently, the gas tax was something like a universal use tax that helped fund highway construction. Drive a car or truck, and, by buying gas, you pay the tax for the wear and tear you create. Sure, you could reduce your taxes by buying a more fuel-efficient car—one that got, say, 30 miles per gallon instead of 15 or 20. But it was difficult for drivers to evade the tax entirely, or even in large measure. Cars and trucks generally fell in a narrow spectrum of fuel consumption, and gasoline use generally rose in tandem with economic growth, as this great Google chart shows. Now things have changed. Thanks to a weak economy and demographic shifts, the number of miles driven in the U.S. has generally declined or been stagnant since 2007. More significantly, there has been a quantum leap in efficiency for basic cars. Hybrids, plug-in hybrids, and electric cars may collectively account for about 3 percent of car sales in any given month. But they are helping to create a new dynamic. With conventional cars, automakers have successfully experimented with engine design and lighter materials like aluminum. According to the University of Michigan Transportation Research Institute, the typical car sold in March 2015 gets 25.4 miles per gallon; that’s up 26 percent from October 2007. The net result: The volume of gasoline sales is falling. According to the Energy Information Administration, the amount of gasoline used in the U.S. in 2014 stood about 4 percent below the 2007 peak—of 3.39 billion barrels—and below the level of 2003. As a result, federal gas tax collections are slumping. In 2013, some $19.4 billion in gasoline taxes were allocated for highway spending, down from $21.2 billion in 2012. The innovation has also created a new dilemma. We now have a class of people (mostly well-off) who can choose to get around without having to pay the gas tax. In effect, the Malibu- and F-150-driving masses are paying gas taxes that subsidize highway and road repair while the elite driving their $75,000 Teslas don’t pay a penny—even though the Tesla creates as much wear and tear and occupies the same amount of space as a Honda Accord. So it makes some sense to introduce mechanisms that ensure all car owners pay for road upkeep. But some of the efforts so far are absurd. The fees are arbitrary—you get taxed just for owning the car, not whether you drive it or not. Virginia’s $64 charge on hybrids was particularly silly. After all, there are regular combustion engines that get much better mileage than hybrid SUVs. (Virginia’s hybrid tax was repealed soon after the election of current Gov. Terry McAuliffe, who was famously involved with a failed electric car company.) Taxing all-electric cars while ignoring plug-in hybrids is likewise foolish. The website Volt Stats has great data about how frequently individuals and groups of owners of the Volt, a plug-in hybrid, drive in all-electric mode. The top individual in this group in Huntington Beach, California, has driven his Volt 18,722 miles, of which 18,255—97.2 percent—were in electric mode. The issue is bound to get worse. Almost every day, hybridcars.com documents continuing advances in efficiency—new hybrids, plug-in electrics, engineering fixes that improve efficiency. Every month, another 10,000 cars that run partially or exclusively on electricity hit the road. The Elio, a three-wheel car that can get 84 miles per gallon, has already taken tens of thousands of reservations. Should buyers of that car be charged an extra hyper-efficiency tax? Innovation has laid bare the fact that making drivers compensate the public for their use of the roads through taxes on gasoline purchases may not work in the 21st century. In fact, it makes much more logical—and economic—sense to tax people based on the number of miles they drive. Sounds like progress. The gas tax was never intended to be a tax on behavior; it was intended to be a use tax. And a use tax only works if pretty much everybody has to use the product in roughly equal proportion to his or her activity. That’s why we should figure out a more fair way to pay for road upkeep—one that doesn’t discourage fuel-efficient driving in the process.